Sinus school deals with a comprehensive range of topics including: obstinate nature of nasal disorders, reasons for avoiding surgical treatment, the need and method of acupuncture therapy. The author, Dr. Woo Jeong, Lee (OMD), who has been dealing with nasal disorders for 25 years shares her own LWM Method she applied to her patients in order to treat ENT problems. In this book, she points out that you do not need to receive surgical treatment to cure nasal problems such as sinusitis, rhinitis or snoring. The most critical reason to avoid surgery is the permanent loss of the unique functions carried out by the nasal cavity and paranasal sinuses. Surgical exeresis of the affected membranes results in permanent discard of the functional layer of the nasal mucosa. On the contrary, her acupuncture therapy in the nasal mucosa is an innovative treatment that not only reduces the swelling to clear the nose but it also revitalizes the membranes to stand against sinus colds. Needle-pricking therapy on the nasal mucosa can successfully treat nasal congestion caused by rhinitis and facilitates the recovery process without having a prolonged course of medicines. Moreover, it reduces the risk of developing chronic rhinitis, by substantially reducing the swelling in the nasal mucosa. Besides, this book particularly arouses readers’ purchasing need, especially those who suffer from nasal problems in that the book introduces self-care remedies that you can practice at home using a suction device or by doing salt-water cleansing. According to Dr. Lee many diseases such as dry eye syndrome, otitis media, Meniere’s syndrome, headaches, the pituitary gland and sphenoid sinus, snoring and restless legs syndrome have often a lot to do with sinus disorders. Rich and specific treatment examples and clinical experiences included in the book will give you professional guidance in dealing with patients in the oriental medical field. After graduating from Kyung-Hee University, majoring in Oriental Medicine, she has been treating patients based on otology for 24 years. Focusing specifically on the unknown nasal cavity and sinuses, she has researched fundamental treatment methods and has successfully treated patients with them. Her own special method is said to have upgraded Korean medicine in treatment of nasal disorders innovatively and currently takes the center stage in treatment of nasal disorders of Korean medicine circle. 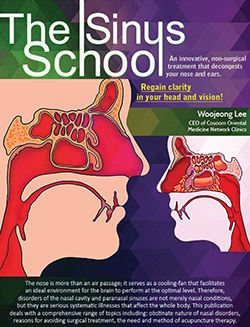 She now actively shares her method by giving special lectures to undergraduate students who major in oriental medicine on rhinitis, sinusitis and the paranasal sinuses and opening a sinus school in Goheung, Jeolla province for both patients who suffer from nasal problems and oriental medicine doctors who wants to learn her method. For more information, please visit The Society for Non-Invasive Snoring and Sleep Apnea Therapy either on youtube or on facebook.